In 2010, TPL managed the acquisition of 84-acre Kiket Island, a privately owned island just east of La Conner that almost became a nuclear power plant in the 1970s. For nearly three decades, the land remained almost untouched by the next buyer who built only a single home, leaving the landscape pristine, with more than two miles of shoreline surrounding a densely forested core. Now this site, considered by many to be the catalyst for the conservation movement in Washington state has made history again. 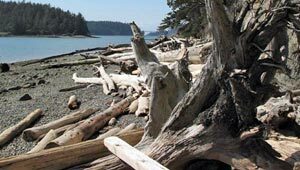 As Kukutali Nature Preserve, it is the first state park to be jointly owned and managed by a sovereign Indian nation, the Swinomish, and the Washington State Parks Department.